With grassy flats, scattered islands, mangrove shorelines, and deep basins, fishing Mosquito Lagoon is an inshore angler’s paradise. Widely considered the “Redfish Capital of the World”, Mosquito Lagoon is known for its abundance of redfish. Mosquito Lagoon is filled with redfish throughout the year, making it one of the most unique places to fish for them. The majority of redfish leave the flats for coastal waters once they mature, but most of Mosquito Lagoon’s redfish never leave its shallow waters. This makes the lagoon one of the only places anglers are able to stalk redfish through the clear waters and cast on sight. The best reels to use for fishing on Mosquito Lagoon are ones that are tough and allow you to feel any slight movement. A baitcasting reel is light and accurate, providing you with a lot more power to help you haul in your catch. As for lures, artificial shrimp lures that are near clear in color come highly recommended. It looks and moves like a shrimp in any type of water or weather, and will make for an exhilarating catch when the lure skims the surface. Redfish associate the surface with food, and will charge at your lure like a heat-seeking missile. While redfish can be caught all year long, Mosquito Lagoon fishing conditions and techniques vary by season. The waters in the winter and spring are low, clear, and cool. This causes most fish to move toward the shallow flats where the water is warm, which makes sight fishing ideal. The best times to fish are usually in the afternoon or evening, when the water is at its warmest. The water in Mosquito Lagoon becomes foggier in the warmer months. Sight fishing is still possible on the grass flats and on the edges in slightly deeper water. Fishing is usually best in the very early morning or in the afternoons. Drift the drop offs, basins, spoil islands, and shorelines of Mosquito Lagoon’s backcountry with Fin and Fly’s inshore fishing charter. 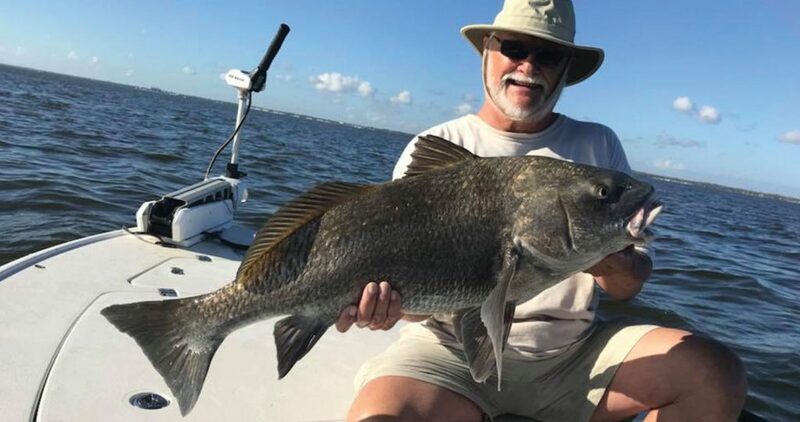 Catch the abundant redfish and enjoy a day fishing on Florida’s most unique lagoon fishing experience.Book online or by phone with Fin and Fly today!